Wang Laboratories, Inc., Lowell, Massachusetts, U.S.A.
Was founded in the 1950s by An Wang, a brilliant Chinese immigrant to the U.S.A.
Wang Labs produced a series of powerful desk calculators beginning with the LOCI in 1966. This employed the novel approach of performing many calculations using logarithms which it generated electronically. 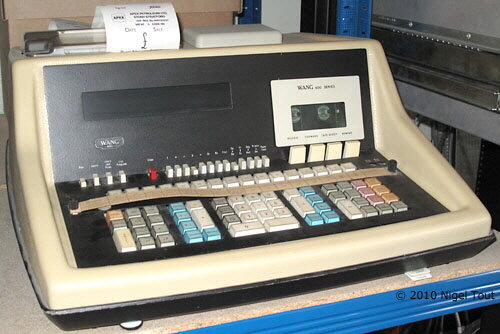 Other models followed into the early 1970s when the company realised that the profit from calculators was likely to continue its decline, and they moved into mini-computers and dedicated word-processors, with which they were very successful. Like others in this line of business, Wang was caught out by the personal computer revolution of the mid 1980s and after making severe losses merged into IBM in the early 1990s after the death of the founder, An Wang. The fascinating history of Wang Laboratories can be read in the book 'Riding the Runaway Horse: The Rise and Decline of Wang Laboratories' by Charles C. Kenney, published in 1992 by Little, Brown and Company. Programmable calculator with amber gas-discharge display, printer, and tape cassette for program storage. Aimed towards business and engineering use.